Sixty six years ago a new group was founded at St Martin's, this was the 'Young Wives' whose leader was Rosina King wife of our then rector the Rev. Leslie King. The group provided evenings of fellowship and activities after the children had been put to bed! We're still here all these years later, the children have grown up and have children of their own and sadly we are young wives no longer. 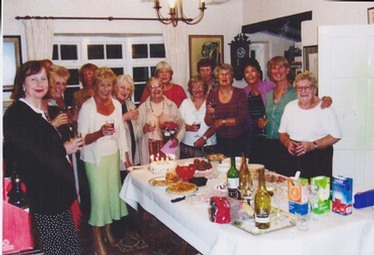 Some years ago we changed our name to St Martin's Ladies group but we still provide monthly evenings of fellowship and activities to our loyal group of twenty plus members. Our meetings (normally held in the Brass Crosby Room on the second Tuesday of each month at 8pm) are very varied. We have illustrated talks from a wide variety of speakers, visits to gardens, games and quiz evenings, a New Year Dinner and an annual plant sale. Details can be found in the Church Magazine. 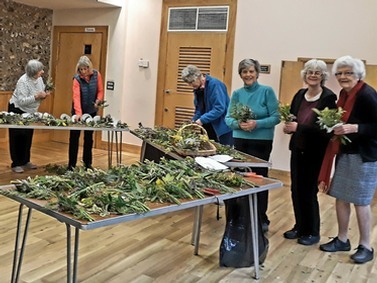 Each year we spend an enjoyable morning making the Mothering Sunday posies, a chance for chatter and creativity. We support the Church by providing a `Home Made' cake stall at the Church garden fete, making teas after special services and in recent years have organised the Harvest suppers. We have also been able to make occasional gifts to the church, such as a baptismal jug, new prayer books, altar linen and a cooker for the Brass Crosby Room. From our subscriptions and fund raising we support a number of charities each year, these have included Demelza House, Victim Support, Cancer Research U.K. Orpington Food Bank and Welcare in Bromley:. I hope I have not given the impression that all we do is `worthy' and serious. Fun and laughter, friendship and caring for each other are fundamental to our purpose. We warmly welcome new members you do not have had to be around 66 years ago! We'd love to see you at any of our meetings and we're trying hard to think of a new title. Suggestions please.